USDA Organic Sencha Green Tea Powder is 100% high quality springtime-picked organic Shizuoka green tea leaves grown and harvested in the historic Makinohara area of Shizuoka. Its deep green liquid tastes very similar to very good quality Sencha loose leaf tea and is ideal for use at home, work or on-the-go. 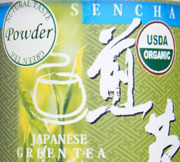 USDA Organic Sencha Green Tea Powder has been grown, processed and packaged according to the strict guidelines of the USDA (United States Department of Agriculture) and is certified organic. This product is vacuum packed in a resealable tin container for extra freshness. Instructions: Add approximately one gram of powder to 100 ml of water and stir. A measuring spoon is included. Adjust powder or water to your taste. 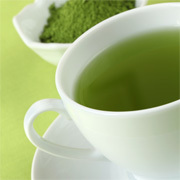 Please Note: USDA Organic Sencha Green Tea Powder dissolves immediately in hot or cold water with very light stirring. In cold water you may notice small beads of undissolved powder at the top, which are not bitter tasting and very healthy. If not consumed right away, some of the powder will settle to the bottom or your cup, so simply stir again if desired.